Last week, Cleveland’s Plain Dealer newspaper ran a story about a person who had been murdered. A body had been found in a pond in Olmstead Township, a small southwestern suburb of Cleveland. What made the coverage of this story stand out was that the body found was of a transgender woman, Cemia “Ce Ce” Acoff. I’m a member of the LGBT community. I’m also a journalist. I’ve got a few fistfuls of bylines, and I’m also in the unique position of being back in college. I’ve been studying the art of journalism – an art I’ve already practiced. I’m digging deeper into the finer points of reporting and writing. 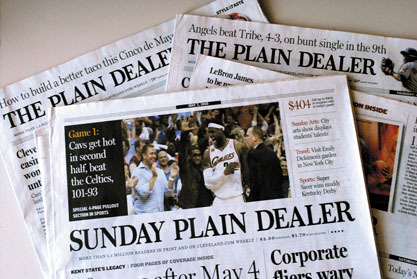 And I can say, unequivocally, that the Plain Dealer has repeatedly dropped the ball on its coverage of Acoff’s death.